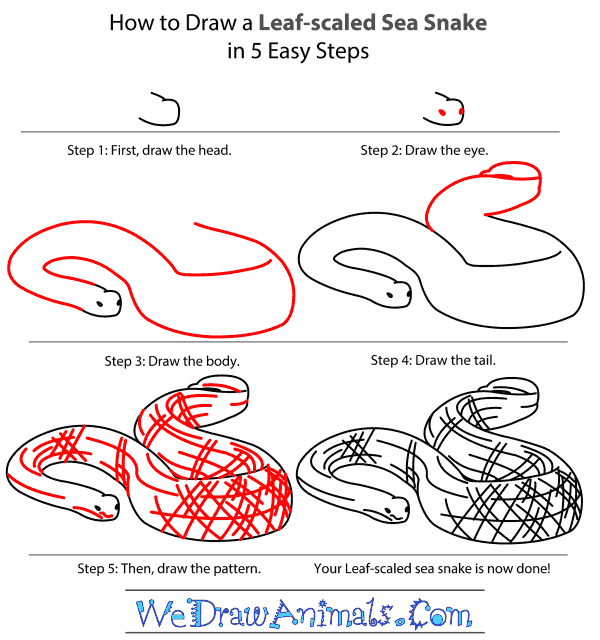 In this quick tutorial you'll learn how to draw a Leaf Scaled Sea Snake in 5 easy steps - great for kids and novice artists. 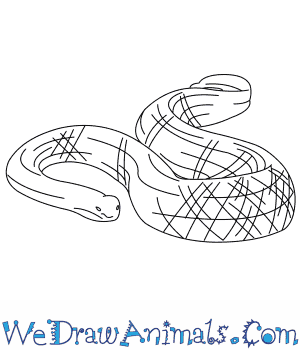 At the bottom you can read some interesting facts about the Leaf Scaled Sea Snake. 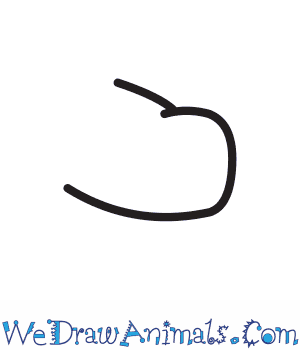 Step 1: Draw a hook shape on its side, with a straight line pointing up from the top end. Step 2: Draw two dots inside the curve of the hook. Step 3: Draw two long, curving lines from each end of the first shape. One line should curve over the other. Step 4: Draw one line that goes away from the top curve, then up. Draw a curve that goes from the middle of the top of the body and meets the previous line. Add another curve on top of this shape. 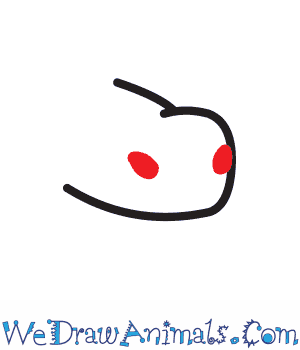 Step 5: Draw lines and hash marks all over the body. You are done! This species has a variety of colorings, but peach and gold are commonly seen. This species is known in the Ashmore and Hibernia Reefs. The leaf-scaled sea snake population has declined rapidly in the past twenty years, with almost no specimens being seen for some years, most likely because of the degradation of their reef habitat. They are Critically Endangered. Leaf-Scaled Sea Snakes are snakes that can live both in water and land. 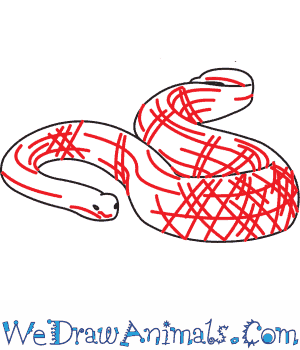 They are long red brown snakes that grow to about 60 to 90 centimeters. Sea Snakes have a long lung that runs the length of their body. 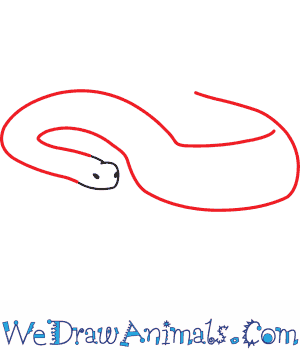 The snake closes it nostrils so no water can get in when it goes into water. Leaf-Scaled Sea Snakes can only be found in coral reefs called Ashmore and Hibernia. The reefs are in the Timor Sea which is near Australia and Indonesia. Leaf-Scaled Sea Snakes have their name because their scales look like leaves stack on top of each other. Leaf-Scaled Sea Snakes are poisonous and poison their food. 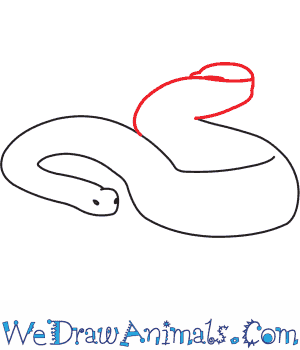 You will not see one of these snakes beyond water that is 10 meters deep. Most Leaf-Scaled Sea Snakes live by themselves, but they have been seen living with other sea snakes. A Leaf-Scaled Sea Snake can go as long as 2 hours before coming up to the surface for breath. Lesson Plan Note: The Ashmore and Hibernia reefs are off the coast of the coast of Australia. A Geographical study of the area is a great partner subject to Leaf-Scaled Sea Snakes and other animals found in the region.